This is an attractive map of the southeastern United States by Henry Walling. Dates to 1868, shortly after the conclusion of the Civil War. When this map was made the southern states were in the midst of economic depression and the reconstruction era. Extends from Tennessee and North Carolina south. Includes Florida and most of Texas. A ship decorates the Atlantic where nautical routes are shown from Savannah to New York and from Havana to New York. 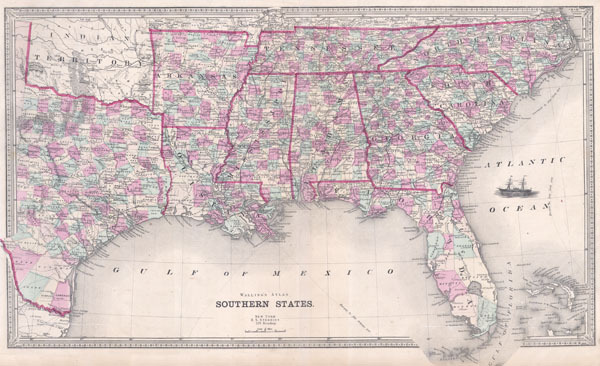 Issued by Henry Walling for his Atlas of the Southern States. Prepared by H. S. Stebbins of 229 Broadway, New York. Henry Francis Walling (June 11, 1825 - April 8, 1889) was an American civil engineer, cartographer, surveyor, and map publisher active from the middle to late 19th century. Walling was born in Providence, Rhode Island. He studied / worked at the Providence Athenaeum before discovering a talent for mathematics and surveying. Walling took a position with Samuel Barrett Cushing, a Providence based civil engineer with whom he issued in 1846 a revision of James Steven's Topographical Map of the State of Rhode-Island. Walling established himself independently around 1850 and immediately began preparing a series of town plans focusing on Bristol County, near Providence. Buoyed by popular interest in his plans, Walling expanded his operations to Massachusetts where, by 1857, he had produced no less than 50 town plans. Apparently Walling's business model involved a contract with town officials to produce a certain number of maps after which he acquired the right to print and sell additional copies on his own account. This work eventually led to Walling's appointment as Massachusetts "Superintendent of the State Map", a designation that begins appearing on his maps around 1855. While Walling's work focused heavily on city and county maps, he did successfully publish three scarce state maps: Maine, Vermont, and Rhode Island. In 1856 Walling relocated his headquarters to New York City where he had better access to quality lithographers. The Civil War proved difficult for Walling and diminished sales may have forced him into a partnership with Ormando W. Gray, with whom he published numerous state, county, and national atlases in the 1860s and 1870s. Around 1880 Walling took a post with the U.S. Coast Survey with whom he worked on various charts until requesting a transfer in 1883 to the newly formed U.S. Geological Survey. Walling remained with the Geological Survey until his untimely death of a heart attack in April of 1889. Very good condition. Minor centerfold discoloration. Blank on verso.